Ready for another giveaway?! How would you like to choose one of these amazing Club SEI kits as your prize? Would you prefer the card kit with subtle patterns and patchwork techniques or the playful papercrafting kit with a variety of cheerful projects? Enter to win using the rafflecopter directions below. One lucky winner will get to pick the May 2014 Club SEI kit of their choice! If you don't want to take your chances on missing out on great kits, sign-up to get them delivered to your home each month! Learn more at www.clubsei.com. 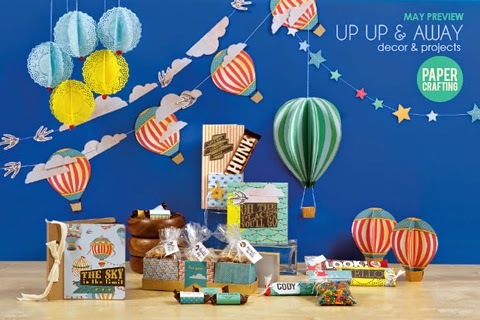 I love the fun look and great colors of the Up, Up and Away set. Boy what a giveaway!!!!! Great Colors Ideas and all with a cherry on top!!!! I love Up and Away but would find more use in the card kit! oooohhhh...BOTH are wonderful kits! Thanks for the chance to win! I would love to win the card kit!! Natalie Gardner: I would LOVE either kit! It's a win win!!! I am already subscribed to the papercrafting kit, so I would love to win the card making one! Thank you so much for the chance to win! The card kit. I send so many cards, I would love to have more! Oh I would looove the paper crafting kit! I am so into the hot air balloon theme right now! Both look like so much fun. I'd go with the cards for Operation Write Home cards. those are both super cute but I would have to pick the papercrafting one, I haven't done many cards in the last few months . Hmmm, tough choice but I think maybe the Up, Up and Away. I like the paper crafting best. I would love the card kit! Love SEI! I love ALL of the different SEI club kits! If I had to choose between these I'd choose the card kit. Thanks for the chance! LOVE the paper crafting kit, super cute with great colors! Love the Up Up and Away set. Love your contests! Thanks for the chance to win one of these great sets! the card kit, but both are fun.. They are both beautiful! I dont think i can choose! Love the card kit, thanks for the chance to win! I love the card kit! What a fun treat. I'd love to enjoy a kit! Oh, If I could only win I would pick the paper crafting kit. Up, Up and away with the hot-air balloons! I'd chose the paper crafting kit! I love SEI! You guys rock! Both of the kits look great but I would love the Card Making Kit. Both of these are great, but I think I would prefer the cardkit because I would use more of the kit! I would love a chance to win the papermaking kit! I already get the paper crafting, so I would pick the card kit. Love both but I would pick the card kit, amazing! I would so love to be able to try out one of your other monthly kits. I already get the scrapbooking kit, which I look forward to receiving every other month. I would like to try the card making kit! Thanks for this opportunity to win one! IF I was the SUPER LUCKY winner, I would choose the BEAUTIFUL card making kit - LOVE the colours and with the patchwork techniques they make DELIGHTFUL cards!!! I love both kits but would love to have the Patchwork card kit. The cards are beautiful and I would love to make them and send them to family and friends. I love love love the papercrafting kit. Those hot air balloons are just cute as can be. I would like to use the card making kit. Both kits look like a lot of fun, but I think I'd choose the card kit! It's fun to have a kit to make card-making fun and easy! Thanks so much for the chance to win! Up Up and Away is just gorgeous...love it! All the kits are amazing! I love the colours and patterns. Love Up, Up and Away. I would love the card making kit.